This guide is written for students by students - most of them British, hence a decidedly British slant and lack of reverence. 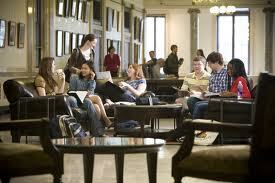 But the insider intelligence and articles are for students of any nationality who wants to study abroad. We've picked top universities in America, Europe, Asia and Australia, and we've set out to find out what they're really like - according to the students themselves. The articles on applying and getting in are by one of the most experienced university counselors on the planet, Anthony Nemecek (formerly Director of the Fulbright US-UK Educational Advisory) with help on updating and additions from the current Fulbright staff. Our writers either attend or have personally visited every university in this guide (except in rare cases, where noted) and have interviewed loads of other students studying there. Our reviews are based almost entirely on the opinions and knowledge of these students. We think that this gives prospective students the best sense of what to expect, and where they would feel most comfortable, but it also means that our findings should be taken with a pinch of salt. Everyone has a different opinion about his or her university. Where we have found a general consensus on a certain issue, we have reported it as more or less the truth. Where there is a large range of opinions, or views are evenly split on an issue, we have tried to capture these nuances. Obviously, however, our writers have not spoken to every student at each university. There may be some who would disagree with how we have presented things, and it is certainly possible that your individual taste may clash strongly with that of the students we talked to. Furthermore, this guide doesn't cover every good college and university in the world. Readers should not take the universities reviewed here as THE definitive list of good ones to consider. Many others are worth looking into. We add new ones all the time, so let us know what you find! We have not tried to fill our reviews with facts and statistics. All of the technical details – the skeletal outline of a university – are available to anyone on university websites, Wikipedia pages and a range of other online resources. What is not usually available online is the real feel of a university: the experiences people have there, the everyday life of its students and the accompanying concerns and commendations they have. This is what makes our guide unique, and we hope you find insight into the workings of some of the top institutions in the US and how to find one that's the right fit for you. One thing that became apparent to us as we compiled it, and that we hope we will communicate to you, is that your choice of university should be difficult precisely because there are so many great options. We hope that picking a university abroad will be one of those good hard decisions, the kind where you can’t really go wrong, and that your eventual choice will be as rewarding as you deserve it to be!